Spoiler to see more and the 4 wheel independent suspension and steering. Comments and criticisms are always welcome! That's a remarkable patrol vehicle there. And a neath idea for the suspension. Does it break easily? And it looks like it can be modularized as well. It could as well be a cockpit for a flying craft, or a lunar train. Nice! Haven't seen many space buggies using this canopy yet. Looks great. Thanks! The suspension/steering mechanism holds up quite well, actually, given that it's two clips at the wheel and two studs (from opposite ends ) on the Technic bracket. As you might have guessed, it's more for display and doesn't really roll all that well (it's a bar instead of an axle at the wheel). It can be a bit fiddly to set up, since it's got four wheels that can be turned in different directions and can each go up and down. As for modularity, the inspiration for it is NASA's actual Mars rover concept, which itself is modular. This is really cute! A shame though that the suspension and steering are more display-oriented than play oriented. 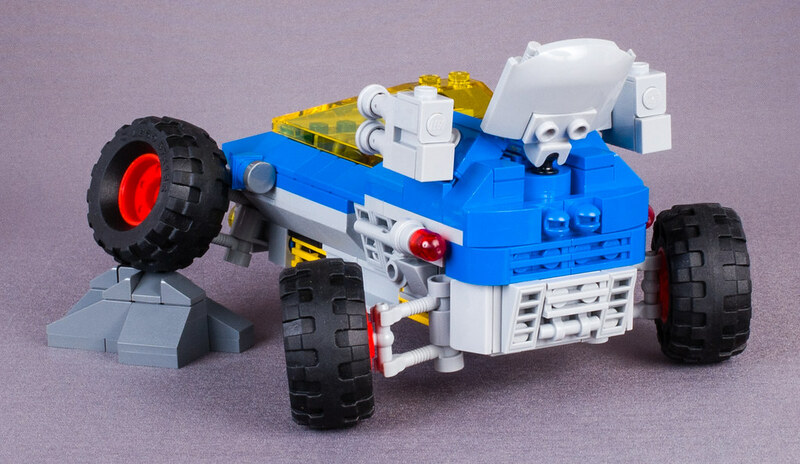 Just my preference—I understand how impractical it would be to implement independent four-wheel suspension and steering at such a compact scale. Batman Tumbler meets Classic Space in this fantastic fusion. 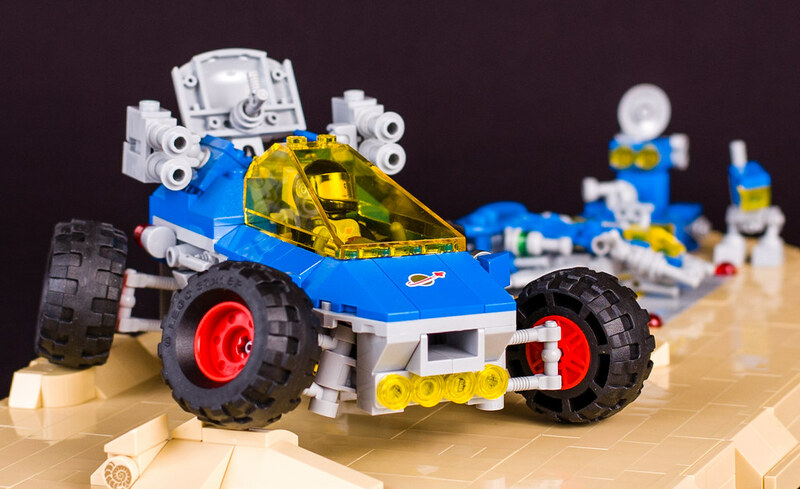 There's no stopping this blue & grey lunar rover. Well done! That is an excellent solution for compact suspension and steering. 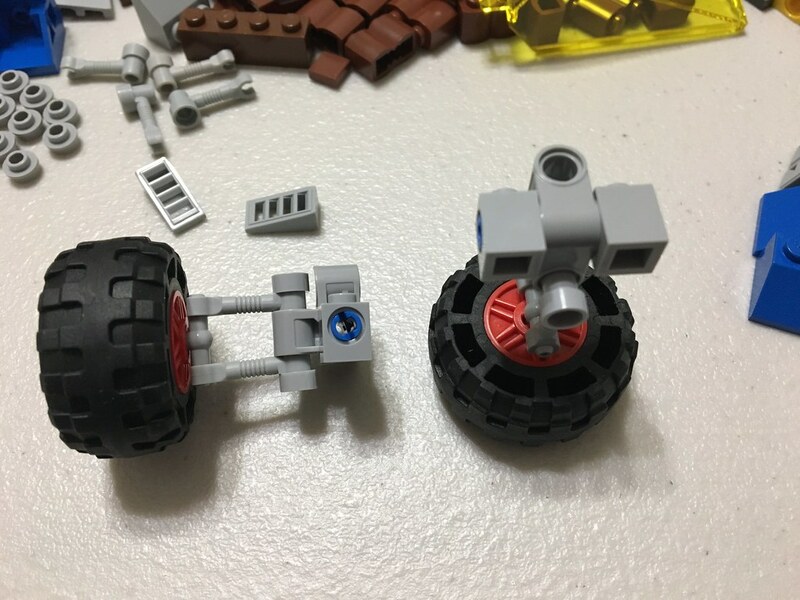 I bet you could make the wheels spin freely by sticking a technic pin 1/2 on the end of those t-bars and using a wheel with a pin hole in it, but I feel like that may compromise the looks and posability, although I'm not sure and I'd be tempted to try it. Definitely worthy of being a display model though; I love your solution for the satellite dish as well, I don't think I've seen that before and it looks great! I think your idea would work! It would push the wheel a little bit further out, but then it would be able to spin freely and still take advantage of the steering and suspension. Just make sure that the wheels are steered properly (in parallel pairs) before rolling or else it won't move anyway. Wow, what a fantastic and technic vehicle! Thank you very much for showing the technic behind it as well! Looks great! 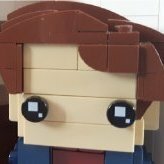 neat idea for the suspensions! This is a really cool rover! 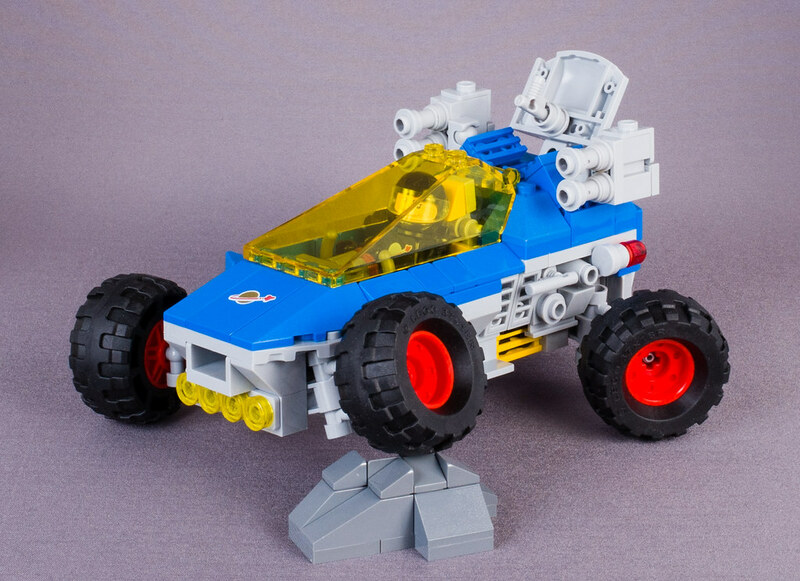 I like the use of the X-wing canopy and the slopes you've put around it, the headlights and intake on the front, the greebling on the back, the equipment on the top of the rear half, the big red wheels and red tires, the way the suspension looks - just about everything except the fact that the wheels don't spin freely. If you modify them to spin freely, I just might have to give this build a try in Studio. By the way, the whole thing looks ten times better than the source material. Looks great! The suspension is really neat. That's an awesome rover pombe !! Even better with this classic space color scheme ! This is a great little river @pombe! Super cool idea for the suspension. Love the suspension on those wheels.